In the morning, after grinding and brewing a fresh pot of local Panamanian coffee, I set up my laptop on my front porch. From here, I have an unbeatable view of Volcan Baru, Panama‘s largest mountain, its highest peak rising above the clouds. I listen as the palm trees rustle with life and brightly colored parrots fly overhead. As a freelance writer, this is my office. At least, it is in the morning. The cost of living is so low here, in Panama’s Chiriqui province, that I don’t need to work full time to afford a comfortable lifestyle. My afternoons are free to spend time with friends, have fun, and enjoy all the opportunities around me. And there’s no shortage of things to do in David, the warm-weather city I call home. 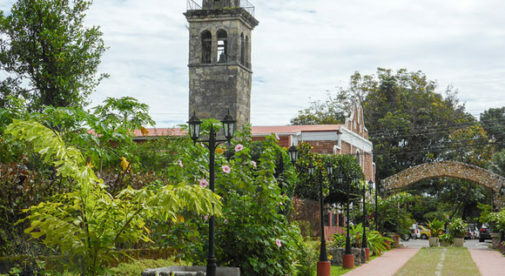 David still has a small-town vibe despite being one of Panama’s largest cities, boasting good infrastructure and all the modern comforts. Only a ten-minute walk from my front door is the downtown area and Cervantes Park. This is a great place to sit and relax, have a snow cone, and people watch in the shade. After a bit of shopping in the downtown area, I’ll generally meet some friends for lunch at one of the local restaurants where a good meal runs under $5. And, when good movies are playing, we go to the air-conditioned theatres where we can enjoy first-run, English-language movies for under $2. When we feel like a bit of an adventure, the Pacific coast and its long, peaceful beaches are only half an hour away. The Las Olas resort by the ocean is one of our favorite places to take a day trip to. With a day pass, we have full access to the pools and facilities, as well as the resort’s distinctive black-sand beach. Sitting by the pool under the shade of the coconut palms and listening to the sounds of the surf is just heavenly. The outdoor restaurant serves my favorite lunch of fried pargo (red snapper). A whole fish delicately cooked to perfection with patacones (delicious fried plantain) and a salad is only $9. When I want to cool off a bit, I head up to the cool-weather mountain town of Boquete. Boquete is a town nestled in a lush, green valley, at the foot of Volcan Baru. It has a large and active expat community so there are always fun things to do there. You can take yoga, painting, photography, and cooking classes. And there are clubs for birdwatching, hiking, gardening, and woodworking, in addition to many others. Every Tuesday in Boquete, the expat community holds a market where vendors can sell their handmade crafts and products. This is a fun place to go, and I’ll often run into friends while I’m here. Vendors sell everything from organic produce to homemade chocolates to specialty goodies you won’t find elsewhere. This is where I buy my favorite locally grown coffee beans and veggies for the week. Of course, a trip to Boquete would not be complete without stopping for lunch in one of its many high-quality restaurants. One of my favorite places to eat is the Fish House. It’s a small place but with a charming and relaxing atmosphere. You can sit by an open window, taking in the cool breeze while listening to the creek rippling over the rocks below. I don’t need a menu anymore because I always order the same dish—the coconut shrimp. It’s a generous portion of crunchy, deep-fried, coconut-battered shrimp with homemade coleslaw and fries. For under $12 with a Panamanian beer, it’s great value and my go to meal in Boquete. Sometimes I can’t believe how enjoyable my life has become. I love the freedom that freelancing gives me and, thanks to the affordable living here, I can live a life of comfort that I could never afford back home.